Life According to Steph: Thursday Thoughts - this is radio nowhere. Is there anybody alive out there? Thursday Thoughts - this is radio nowhere. Is there anybody alive out there? 1. This is one of my favorite neutrals: Lion Around by Essie. 2. I'm getting a pedicure at some point this weekend. I need one. I have a massage scheduled for Sunday too. And I got my hair done last night by the fabulous Kristi at Sensational Scissors. So that about covers it for personal upkeep. 3. Speaking of self-care...for those dug in against our current leaders and despairing anew every time someone's right or voice gets whacked away by trump's poisonous pen, you need to read this article: How to Stay Outraged Without Losing Your Mind. We're playing the long game right now and we can't afford to burn out. Recharge. Resist. In the interest of my own self care and in yours, I am not going to go through the events of week one of the trump presidency that made it a dumpster fire for dems and progressives. Instead, I had cake for breakfast yesterday. 4. Monday night our dogs walked around crying, howling, shivering, and cowering with their tails between their legs...not because they were being abused, no...because House Paws the mobile vet came. It was a very traumatic day in our household - if you don't know pugs, you don't know the histrionics that are performed over nail clippings. It is embarrassing. Anyway I love the mobile vet. Geege got his biannual checkup and everyone got cleaned up a little and I didn't have to wrestle three belligerent resisters into a vet's office. Geege apparently has crystals in his pee and just like that the dogs are back to not earning their keep. 6. This week is the anniversary of Jonas, when we took in some water at the shore last year while we were in South Africa. We fared better this time! It looks like it stayed away from the first floor door. It's nice to know someone down there who reports in with photos. 7. Currently reading Indiscretion recommended by Lauren. It's rare for me to remember who recommended a book, so when I do, I'm giddy. What are you reading? 8. 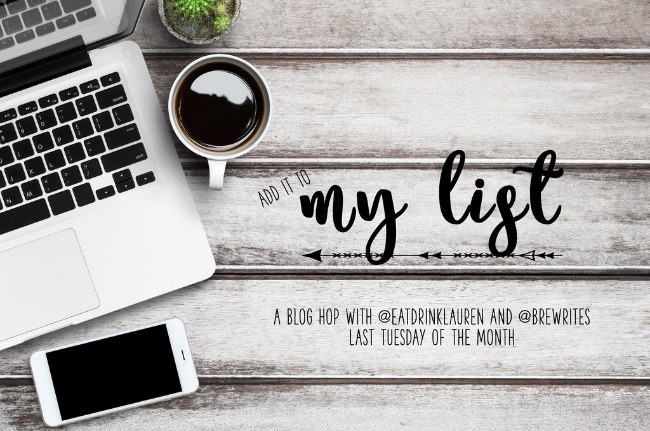 I had fun sharing what I'm loving lately last week. As I mentioned, I used to do that monthly but got out of the habit. 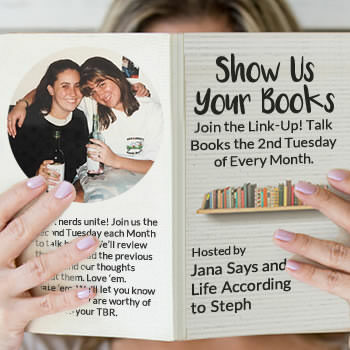 I will probably get back into it since Lauren and Bre are hosting a new linkup the last Tuesday of every month. Meaning, this Tuesday coming up. 10. Ecard of the week...winter mornings, am I right? i read that dogs can just *tell* when they're going to the vet or in your case, when the vet comes to them. poor pups! LOL. That last ecard is where I'm at at this exact moment. I love how much self-care you're doing! I'm getting my hair cut today. I needed some selfcare after this week. And I'm about 6 months overdue for one. Thanks for posting the article. This is a marathon and I need to breathe. Sometimes cake for breakfast is a necessity of life. Yesterday we had a bunch of freezing rain and high winds and bed felt so cozy. I'm usually ok with getting up in the winter, but if I can hear the weather I'm a big nope. Oh man, I so wish I had a mobile vet or mobile grooming van that was around me. It would make life so much easier on us. 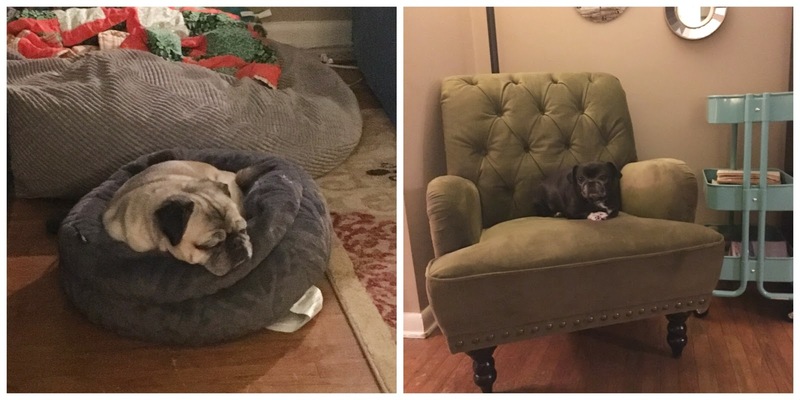 I still love the pugs in that new tight cozy dog bed. haha Mae the queen. She looks so pleased with herself too. Hawkeye does okay at the vet, thankfully, but I think because there's just one of her. 3? Hell no. Thank goodness they came to you. That cake looks amazing, I'd eat it for breakfast too. I think our Sasha is a big pug! That cake looks wonderful! I'm trying not to eat leftover Stock's 🎂 Cake! It's great right out of the freezer, though. Thanks to the universe for no nor'easter damage in OCNJ ❣️ Happy Friday Eve to all! I read that article today about how to keep sane, and I'm taking it to heart. I need to take a step back for a bit because every day feel overwhelming with the CNN alerts on my phone about what he's up to now, plus all of the lies he and his troop are putting out there in terms of attendance and voter fraud. I just can't. Woosaaaaaah. Thanks for the mentions and I always like seeing your recs in any posts. It's nice to have them contained in one place. I love Mae on the chair. In my house, that would be referred to as her being the Castle Queen. 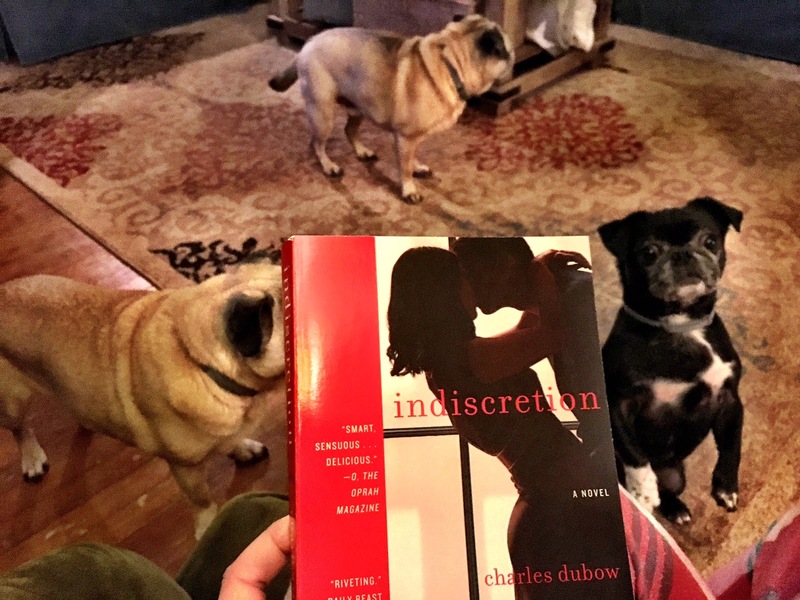 Let's talk post-Indiscretion. The cover makes it look so 50 Shades but it definitely isn't. Ha. That last ecard is my life every damn morning. Dogs are immediately drawn to new furniture. The moment we move a couch or chair or bed into the house Lylee's booty is planted on it. Geeeez, dog. cake for breakfast sounds about how i'm dealing with things lately as well :) thank you for sharing that link though, very helpful. i'm easily overwhelmed with things like that and just want to hide and ignore, which isn't what i actually want to do, if that makes sense. anywho. love that neutral colour! and your new chair! fancy! yay for a new link up! i'm trying to get back into it and all that so that sounds perfect. Mae on the chair is freaking adorable! The article is exactly what I need right now. I want (need) to keep the fire burning but I'm seriously worried about burnout because it has been a week and so much RAGE! 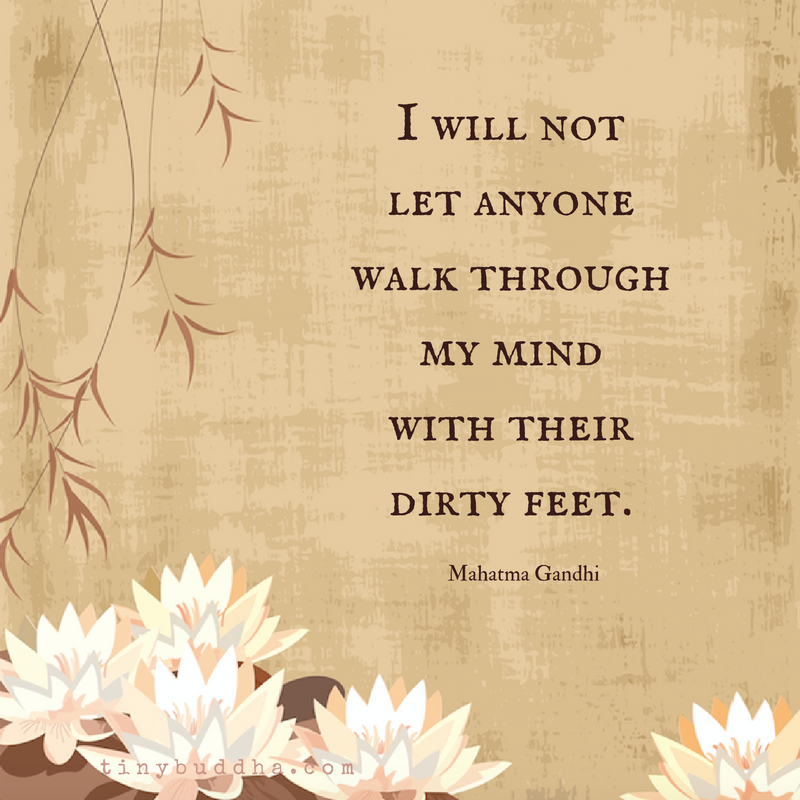 The Gandhi quote is one of my favorites. This week has been unbelievable. I seriously can't believe this man was voted into office (even if Russia may have had a hand in it, and the EC definitely did). #9. That is so good. And that article is JUST what I needed to read. Because if the past few days are any indication (and they definitely are) I can't imagine feeling this way every day for the next four years. Aw, your poor dogs! My dog hates going. The mobile vet sounds awesome and a bit easier. This whole week has been ridiculous when it comes to politics. It's definitely important to do self-care and not get burnt out though. It's very stressful. Thanks for number three. Link seems to be broken though, getting a 404—got another for it? Your dogs should have their own sitcom. The pictures of Geege and Mae is their respective "beds" is fantastic. Mae really IS a queen, eh? Heheh! I do love the picture of Mae on her "throne." That's great! I think cake for breakfast is perfectly acceptable from time to time! Mobile vets are genius!!! I'm due for my mani/pedi/haircut too and just made all the appointments today! Yay! Haha! I love that Ghandi quote so much and it's definitely something I need to repeat more often. I'm gonna look into that link up! I need to get back in the game. Hahaha Mae certainly looks like the queen to me! Is she not? I wish we had a mobile vet like that! I had to figure out how to corall Mac and a car seat into the vet office today for his grooming and nails and it was quite a show. 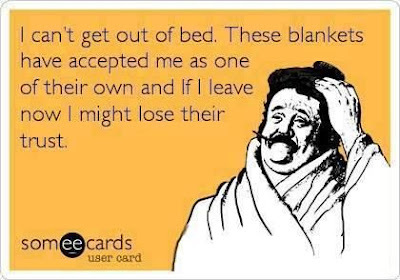 Yes about the blankets and winter mornings. Also flannel sheets. I have resisted flannel sheets for a very long time because I like cold, smooth sheets, but I caved and tried flannel for Matt's sake and I might use them all year long. So cozy. I'm pretty sure we buy furniture just so the dogs have a place to sit. I like that nail color a lot. Also, bakery cake is the best cake. I like to store it in the freezer. Have you tried cranberry crystals in his food? That cake looks so good. I wish that's what I had for breakfast this morning. I miss reading. I need to hurry up & finish the book I'm reading (Indwelling) & then read the next one (The Mark) because they're both due back to the library within a few weeks I think. The only thing I'm actually reading now are textbooks and articles about Communications Ethics & Organizational Communications.